If you want to split the information in a cell and get only few number of characters in a particular cell you can use the simple functions like LEFT or RIGHT. LEFT function will give the number of characters given in the formula from left of the referred cell. If the number of characters is not given, then it will take it as 1. For example, the information contains Employee Number and Employee name in same cell, then the employee number can be separated using LEFT function. 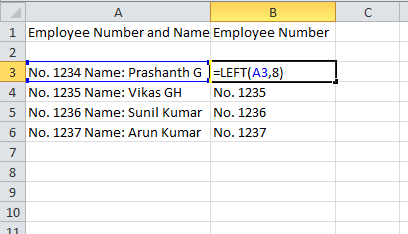 Count the number of character from left in the employee number and mention the number of character in left formula, this will pick the given number of character from left in the referred cell. 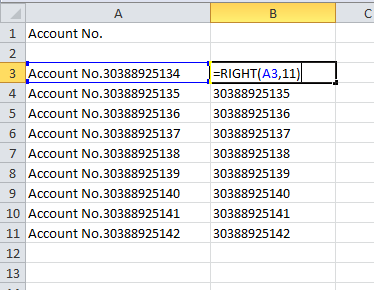 RIGHT function will give the number of characters given in the formula from right of the referred cell. If the number of characters is not given, then it will take it as 1. For example, bank account number are given in the following format including the text “Account No.”, the account number only be separated using RIGHT formula. Number of digits in the account number given in the formula to extract only account number. If you want to find out the number of characters in a cell, you can use the simple formula LEN.